The most volatile years have a red square and the least volatile a green square. The average for every decade is denoted by the horizontal orange line. Please note that the volatility data for this decade and this year is partial as the year is not over. 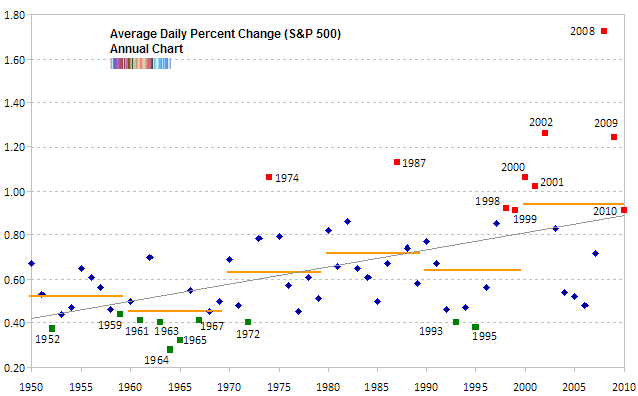 Does the last decades increase in volatility suggest a permanent change in trading characteristics? I have my own opinion, but I will let you draw your own conclusion before sharing mine with you. Edit: Babak here, I’ve added the linear regression (grey straight line) to show the “slope” of the change more visibly. Thanks Wayne, this data paints a very interesting picture. FWIW, I do think that the market change will be with us for a while - that is until the structural changes are unwound or new ones come online. In the meantime, we have to start seeing these crazy daily moves as somehow “normal”.